There’s a reason why legendary chef Wolfgang Puck shows up throughout this list: he’s just that good. 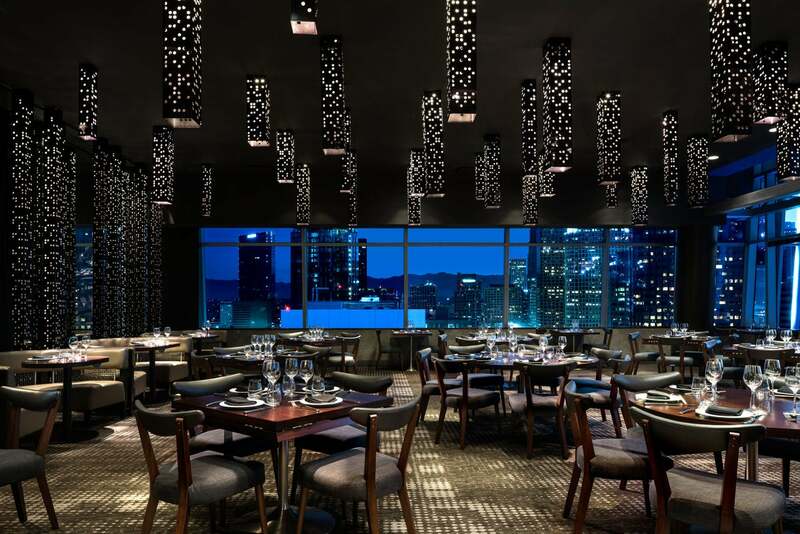 With WP24 at The Ritz-Carlton, Los Angeles, Chef Puck brings modern Asian cuisine to the table in a sharply stylized dining space, backdropped by sweeping views of the ever-expanding L.A. skyline. 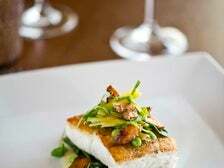 Even if you weren’t seated 24 stories above Downtown L.A., the broiled Japanese black cod, marinated in ginseng honey and a black sesame vinaigrette, is enough to make you feel high. Other inventive reconfigurations include the whole roasted Peking duck, joined here by ripened cherries and steamed bao, and a spicy General Tso’s style dish built around quail. An accessible list of Asian beers and sakes aren’t just the sensible choice, they’re the tastiest as well. Unless, of course, you’re an oenophile, in which case there’s more than 400 bottles to keep you company. And don’t be fooled by the so-called "tiny dumplings." The pan-seared potstickers are quite adequately-sized, thank you very much. In October 2017, Chef Michael Cimarusti (Providence, Connie & Ted's) opened Best Girl at the Ace Hotel in Downtown L.A. Located at street level in the former LA Chapter restaurant space, Best Girl is being touted as "a neighborhood bistro serving a menu inspired by the vibrant city of Los Angeles." Chef Adam Walker is helming the kitchen, while pastries and desserts are offered by Cimarusti's wife, Crisi Echiverri. Open daily for breakfast, lunch and dinner, Best Girl expands Cimarusti's repertoire beyond his acclaimed seafood. 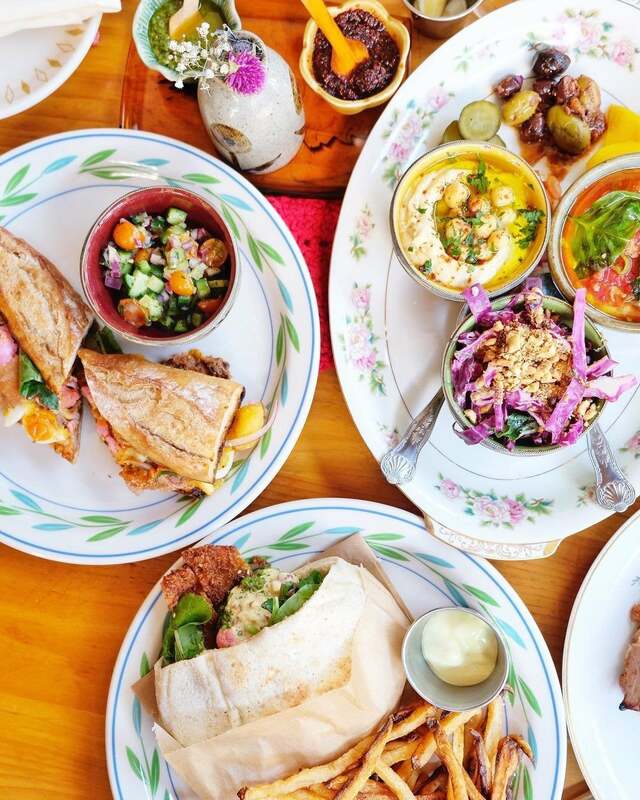 Start the day with Avocado "Alligator Pear" Toast or the Lamb Merguez Scramble with pistachio hummus, mint, pickled piquillo peppers and warm pita. Lunch features Frisee au Sable (smoked black cod, mustard vinaigrette, olive oil, croutons, 63-degree egg) and a Tonkatsu-Style Chicken Sandwich with yuzu koshu mayo and creamy miso cabbage. Dinner highlights include calamarata with spicy pork ragu (pork shank, calabrian chili, locatelli romano), rock cod with Saltspring Island Mussels, jidori brick chicken, grilled duroc pork chop, and a porterhouse for two. 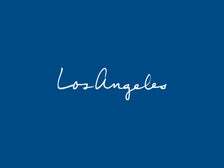 The Exchange - Freehand L.A. Located on the ground floor of the Freehand hotel in Downtown L.A., The Exchange pays homage to the 12-story vintage blade sign (the largest in L.A.) that beckons travelers and locals alike. The restaurant is led by the team behind Bar Lab (27 Restaurant at Freehand Miami) and Angeleno chef Alex Chang, best known in L.A. for his Paladar dinner series. Featuring a stunning interior by designers Roman & Williams, The Exchange explores the global flavors of the L.A. melting pot through an Israeli lens. The all-day restaurant serves a hearty Breakfast Spread with house-made labneh, hummus, avocado, tomatoes, cucumbers, feta and manoushe flatbread. Couples (or really hungry singles) can nosh on the Shakshuka Divorciados for Two, featuring baked eggs in red and green sauce, long hot peppers and feta. Lunch highlights include the signature Exchange Burger with brown butter, American cheese, lettuce and griddled onion; Tunisian Sandwich with tuna conserva, preserved lemon, hardboiled egg, potato, olive and harissa; and Eggplant Sabich with Japanese marinated eggplant, seasonal amba, tahini, herbs and pickles. For dinner, the outstanding hummus is a must-try appetizer. The Salatim Platter is a great shared starter, featuring three of chef's daily selections, pickles, olives and housemade bread. Mains include grilled lamb kebab with stuffed poblano chili, kale, feta, potato and pistachio; Pargiyot (grilled chicken) with shawarma spice, carrot mole and yogurt; and a Daily Catch - grilled fish with black olive and seaweed chermoula, fennel pollen and citrus. 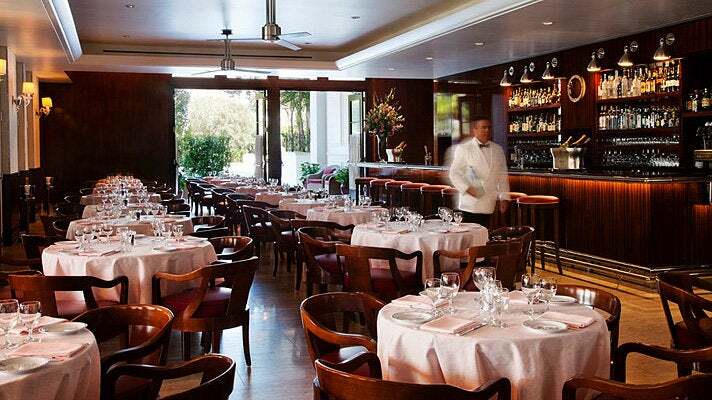 If your kitchen is housed in the Four Seasons Hotel Los Angeles at Beverly Hills, you'd best bring your A-game. When it comes to recreating a Roman enoteca, Culina aces the test with flying colors. 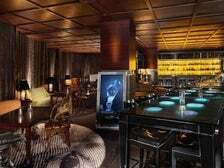 For starters, the sleek, marble-laden interior is home to the city’s finest crudo bar (think Italian sushi). Snack on ahi tuna cured in tangy salsa verde, with capers and parsley, before letting loose with a their housemade spaghetti, served with calamari, rock shrimp and bottarga, all bathed in squid ink. For mains, the Branzino and the braised lamb shank reign supreme. Naturally you’ll adjoin them with any number of seductive Italian reds, by the bottle or glass, but don’t deny yourself the opportunity to marvel at a surprisingly inventive trove of cocktails. It’s not every day that you’ll find yourself celebrating Mussolini’s Revenge - an aromatic tequila drink studded with red grapes and basil. 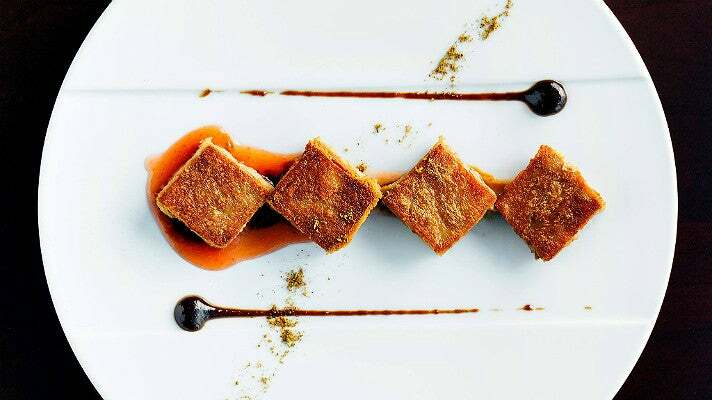 Chef José Andrés has spent decades at the forefront of the molecular gastronomy movement. In his first foray into L.A., the Spanish impresario dazzles guests with a whimsical approach to tapas in a postmodern setting. A cornucopia of artful small plates are designed to share, allowing for a parade of seemingly unending flavors. Although the menu continually evolves, several staples have emerged. 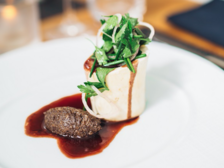 The Philly Cheesesteak, a bite-sized puff pastry filled with creamy cheddar, and wrapped in lightly-seared Wagyu, is more than just a fan favorite, it epitomizes the eatery's approach to gourmet dining: nothing is too precious. Not convinced? Try a morsel of savory foie gras, wrapped in cotton candy or any number of traditional cocktails jazzed up with unexpected accompaniments such as salt air foam, or atomized scotch. Experimentation is encouraged, because even if you don’t like everything you try, you’re unlikely to ever forget it. Don’t be led astray by the white tablecloths, marble flooring, and Venetian chandeliers; The Restaurant at Mr. C is built around approachability. For a solid sense of what that means, order the $49 three-course prix fixe. Although it changes daily, it invariably involves a cross section of classic Italian fare, honoring the Cipriani family name. 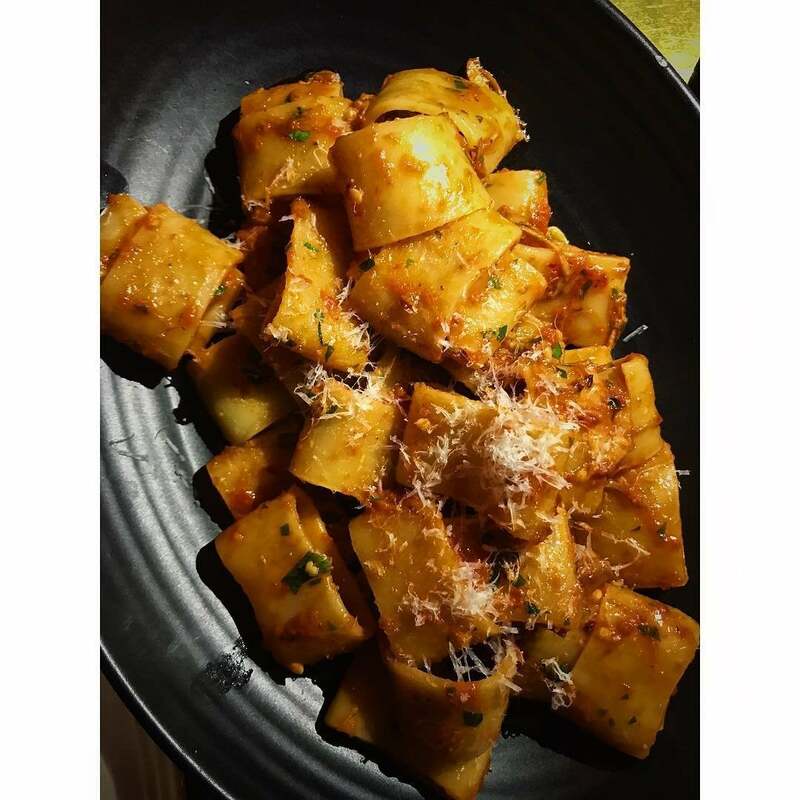 Esoteric cuts of pasta, including tagliolini, paccheri, and tagliardi are bathed in unctuous ragus and pestos — hearty, and begging for Nebbiolo. You’ll be rewarded for experimenting with less-heralded starches, but you're best off splitting the pasta course, as you’ll want to save room for the main. Their famous veal chop, seared with butter and sage, is worthy of many repeat visits. 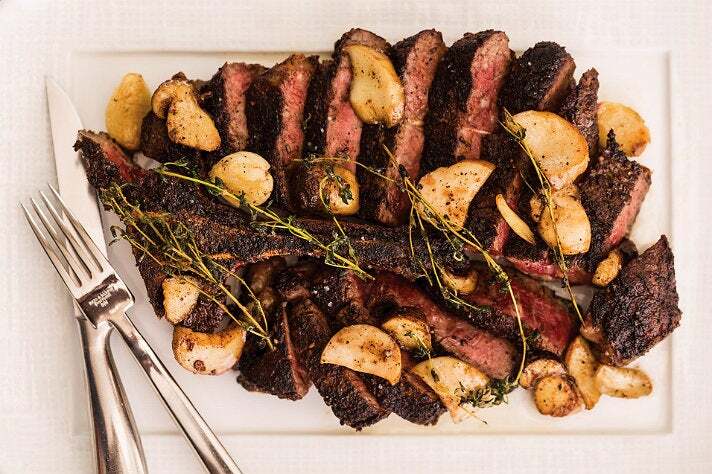 It shouldn’t be a surprise that the stately Beverly Wilshire houses the city’s most ambitious steakhouse in its foyer. Under the direction of Wolfgang Puck, how could it not be? 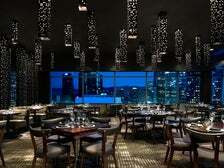 Beyond the stellar cuts of meat - and they are truly nonpareil - diners are treated to a display in flawless hospitality. A menagerie of amuse-bouche makes its way to the table before you even have a chance to marvel at your surroundings. Anchoring the tiered dining space is an open kitchen, revealing a 1,200-degree broiler tended by a tireless crew of experts. Sommeliers stand at the ready, assuring maximum viticultural enhancement of your particular protein. But before it comes to that, marbled slabs of raw Japanese and American Wagyu are carted out tableside, allowing for an educated decision, foreshadowing the charred perfection soon to follow. While you wait for that, start with the blue crab and shrimp cocktail, along with the maple glazed pork belly. Hardly traditional steakhouse fare, and unapologetically so. For the showstopper, spend the premium for the Japanese ribeye. As tender as your imagination will allow, chewing it is recommended, but not at all necessary. 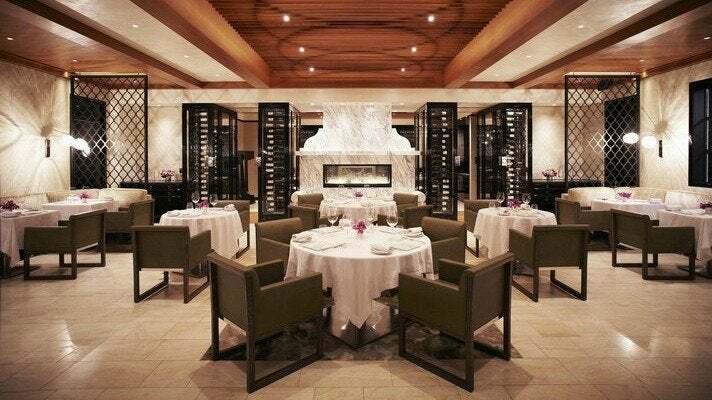 A tranquil detour from the constant din of the city, Wolfgang Puck’s eponymous eatery at the Hotel Bel-Air offers a concise, focused menu, with virtually every item a triumph of modern California cuisine. 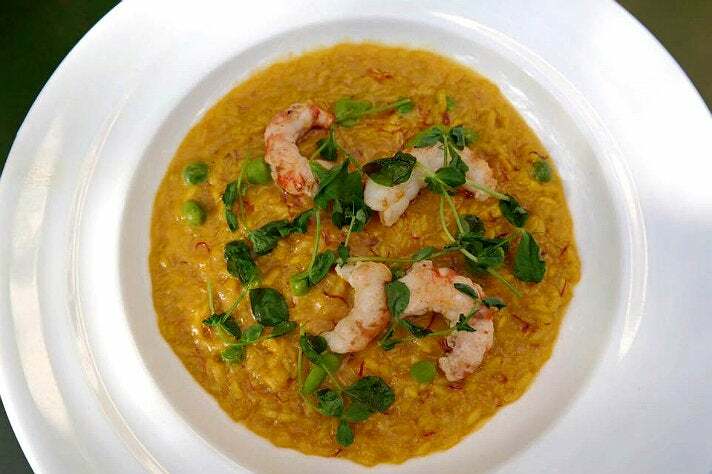 Given a relatively slim selection of dishes, the list is impressively eclectic. When in season, a Maryland soft-shell crab salad, lined with shaved papaya and carrots, and dressed in a Thai vinaigrette is no more or less out of place than a slow-roasted, flakey-crusted pot pie. You could very well find these on a table next to a porcini mushroom risotto, dusted with Italian black truffles. On their own, they are each exceptional, but that these widely varied arrangements can all shine together is the hallmark of a masterful chef de cuisine. 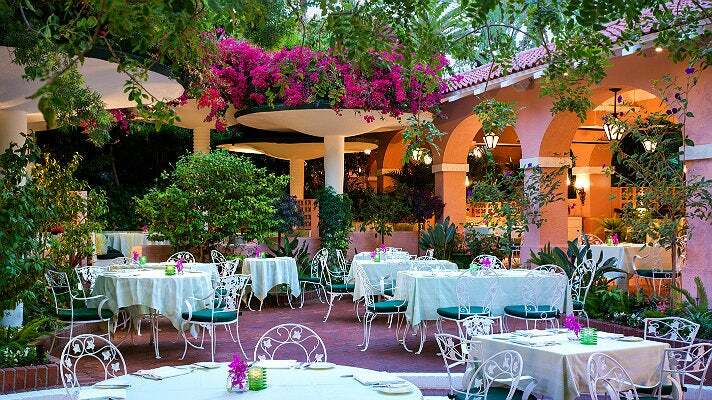 Worth taking note: their enchanting alfresco patio and garden is the site of the most calming afternoon tea in the Greater Los Angeles area. To find “Old Hollywood” you often have to step outside of Hollywood itself. 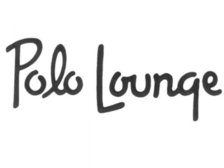 The iconic Polo Lounge at the Beverly Hills Hotel is a fine example, a lasting ode to a bygone era. The food and drink remains faithful to mid-20th Century classics: an oversized McCarthy salad, the Cobb’s classier cousin; rigatoni bolognese, enjoyed at this very location by several members of the Rat Pack; Moscow Mules and perfect Martinis to wash it all down. Although little else has changed in this landmark - including live piano accompaniment during dinner and jazz for their famous Sunday Brunch - the prices surely have. Despite all that robust, ground wagyu is in its patty, even Howard Hughes would have shuddered at a $40 hamburger in his day. Boxwood on the Roof floats like a feather ten stories above the legendary Sunset Strip, featuring a menu that's almost as expansive as the views of the surrounding city. 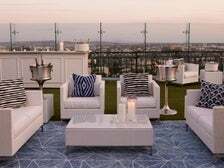 Located at The London West Hollywood, Boxwood's lounge like-feel is accentuated by plush seating, firepits, and live DJs at night. The relaxed atmosphere belies the seriousness of an accomplished kitchen, plating ethnic specialities ranging from Japanese eggplant robata, to lamb ribs prepared with tikka masala. The restaurant fired up its Sunday brunch earlier this summer, highlighted by a rich and creamy Lobster Benedict with artichoke, served atop a most unusual English muffin. 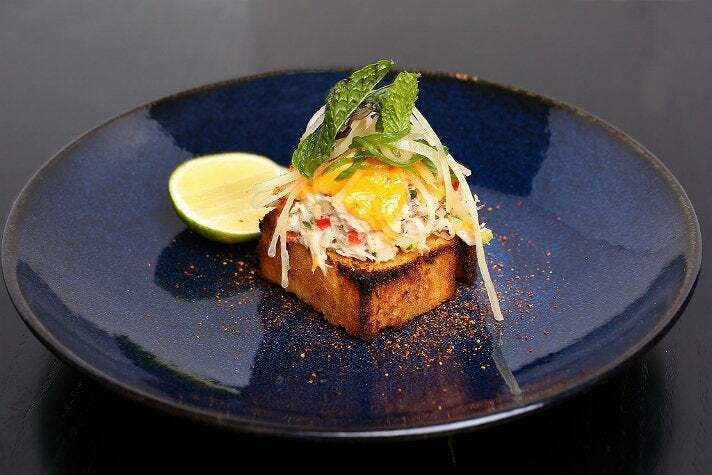 The duck hash with poached egg is another savory standout, preceded by a papaya-sweetened Dungeness crab toast appetizer. Elderflower Mimosas and Watermelon Bellinis by the pitcher wash it all down, refreshing the palate and cleansing the mind. A live jazz trio, framed by citywide panorama, gently encourages you to embrace it all as it comes. Perched atop the dramatic oceanside cliffs of the exclusive Terranea Resort in Rancho Palos Verdes, mar’sel excels as a spectacle for all senses to enjoy. 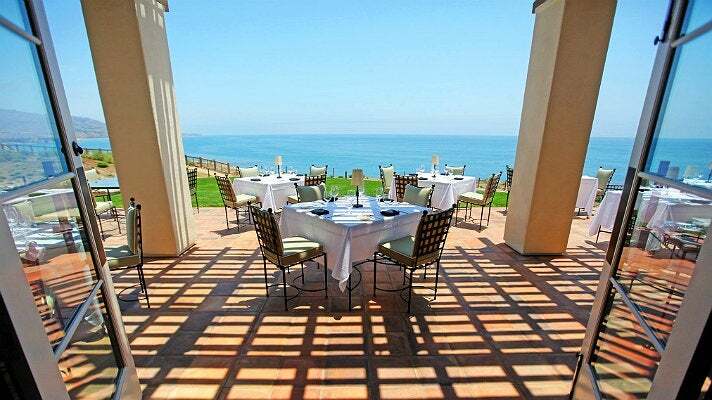 When it comes to setting, it’s difficult to imagine a better vantage point for a Pacific sunset than the restaurant’s terra-cotta formed dining patio. Chef de Cuisine Andrew Vaughan is burdened with the monumental task of plating meals befitting this majestic vista. His approach relies on sourcing seasonal, local ingredients; vegetables plucked from the resort’s own hilltop garden; seafood and livestock procured from nearby fishermen, farmers and ranchers, whenever possible. Loaded with this arsenal, Vaughan takes California cuisine for a spin with dishes like roasted baby heirloom carrots with pea tendrils, strawberry salad with toasted pistachios, and king trumpet mushrooms with crispy nettles. In his barbecue shrimp, he pays tribute to his native Louisiana. Even though seafood platters and grilled Pacific fish are particularly suited to the surroundings, good luck ignoring the wagyu ribeye. It pairs beautifully against an exhaustive collection of Italy, France, and Northern California’s finest full-bodied reds.